I have a love/not-so-much relationship with pumpkin pie. On the one hand, I love it. Well, at least I love the theory of it. I love pumpkin and pie and especially chilled pies that you top with whipped cream. And I love how utterly classic it is. 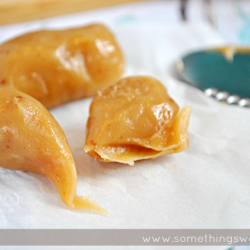 But occasionally, depending on the recipe, I find the texture to be somewhat…. gagging. For lack of a better word. Sorry about that. Sometimes I feel like the innards of a pumpkin pie can be a little bit goopy… not my favorite. Anyone else? First of all, the filling bakes to be a little bit firmer (not dry or hard, just a little more set up), which eliminates the goopy factor altogether. Not to mention, it’s less filling overwhelming your mouth all at once– I like my pumpkin pie in small doses. Plus, the crust to filling to whipped cream ratio is perfect in a mini pie. And you can eat, like, a million without feeling bad, because they’re tiny. Everyone in the world has agreed on that point, right? 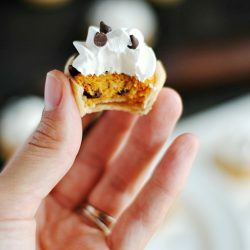 I first started making this recipe in 2010, when Bakerella posted these Pumpkin Pie Bites on her blog (when I first discovered food blogs!). And I’ve been in love with these mini pies (and food blogs!) ever since. 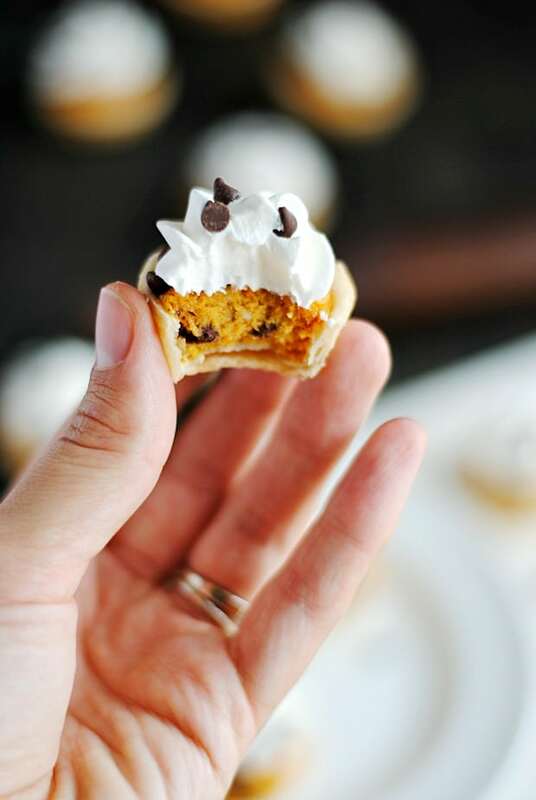 One of the very first blog posts I ever did was these miniature pumpkin pies, so today I’m shaking things up a little and making them even better: I added mini chocolate chips! Mini chocolate chips make everything better, and I don’t think I’ll ever be able to go back to the plain version of these pies ever again! These pies are fun and festive and delicious, perfect for holiday entertaining. It won’t take long for these little treats to disappear from the table! Mini chocolate chips make everything better, and I don't think I'll ever be able to go back to the plain version of these pies ever again! These pies are fun and festive and delicious, perfect for holiday entertaining. It won't take long for these little treats to disappear from the table! Use a cookie cutter to cut 12 crust circles. You will need to roll the dough thinner than it comes out of the box. Brush egg whites or milk over the top edges of each pie. In a stand mixer, whisk cream cheese, sugar, canned pumpkin, 2 eggs, vanilla and pumpkin pie spice together until thoroughly combined. Fold in the miniature chocolate chips. Bake for 12-13 minutes, until puffed and set. Remove pies to cool and repeat with second pie crust. Cover and chill pies until serving (best served chilled). Top with a stabilized whipped cream before serving (I used Cool Whip). Everything tastes better when it’s mini and these look just..adorable! And way too easy to pop :) Pinned! Yes, mini solves so many problems. I would devour these! I think this would be great for any fall party or to grace any Thanksgiving table. I am going to try these! Yum! YES! Mini pies make the filling so much better. Love these, obviously. Awww how CUTE are these! I just want to gobble them all up! Yum, yum and super cute! I agree, all thing mini just taste better! 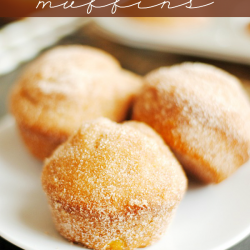 I love the chocolate chip addition…it would be so hard to go back to plain after these! Dang, why are mini things so much cuter!?? These are adorable and I bet I could polish off about 12 in one go! circle cookie cutter did you use? These look great! Was wondering what size circle cookie cutter you used. Thanks!